© 2002, © 2018 by Paul Freeman. Revised 8/26/18. 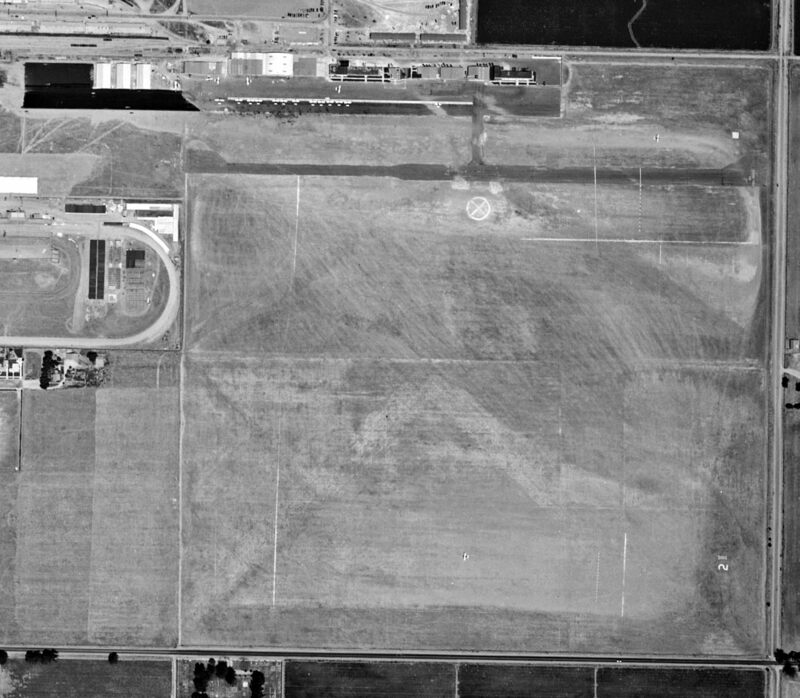 An 8/21/47 USGS aerial view of Parsons Airpark. as it was not yet depicted on the 1946 LA Sectional Chart. 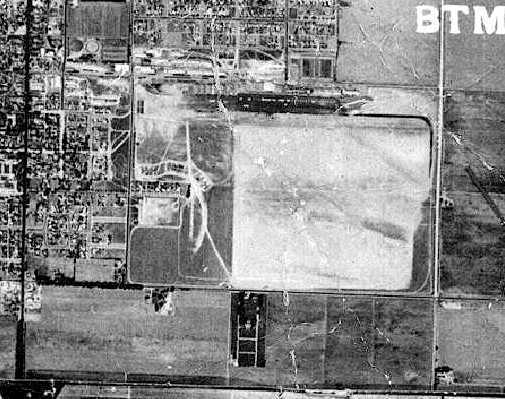 The earliest photo which has been located of Parsons Airpark was an 8/21/47 USGS aerial photo. It depicted Parsons as having a single east/west runway with one small hangar on the northeast side. The earliest aeronautical chart depiction which has been located of Parsons Airpark was on the 1949 Sectional Chart (courtesy of John Wiley). It depicted Parsons as a commercial/municipal airport. An undated aerial view looking north at Parsons Ranch Airpark from the 1950 Air Photo Guide (courtesy of Kevin Walsh). 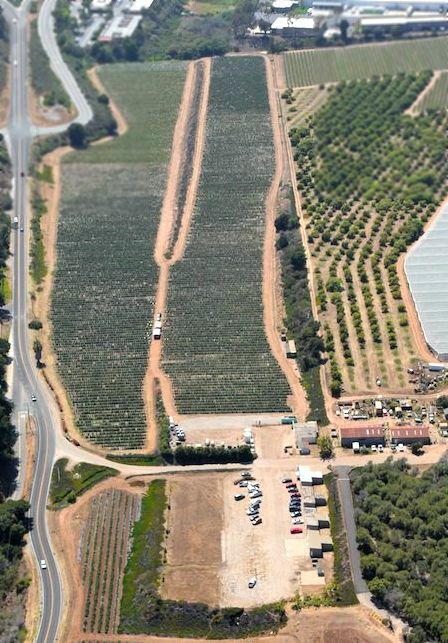 The guide described Parsons Ranch Airpark as having a 2,000' sod Runway 8/26, and listed the manager as Louis Parsons. with 2 small buildings on the east side. 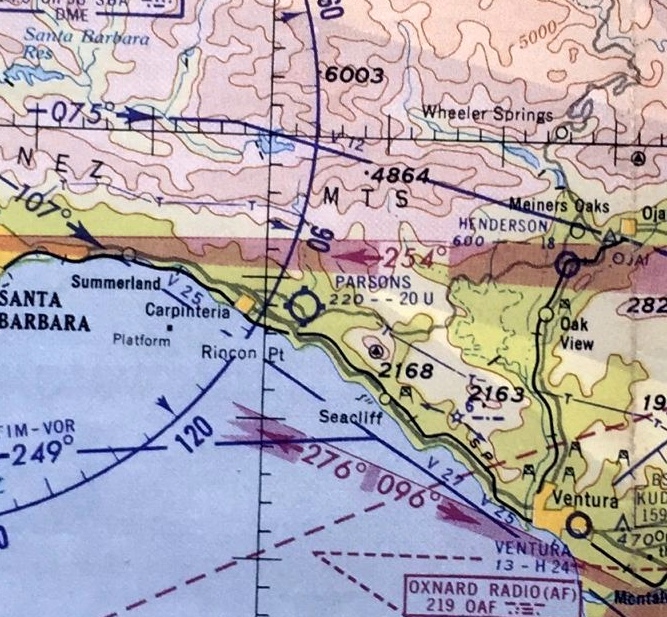 The earliest aeronautical chart depiction which has been located of Parsons Airpark was on the March 1960 LA Sectional Chart. It depicted Parsons as having a 2,000' unpaved runway. 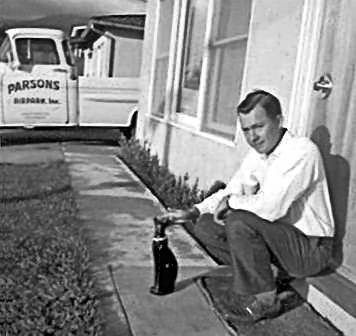 A November 1960 photo of airport founder Louis Parsons in front of a truck painted with "Parsons Airpark". with 5 small hangars on the northeast side. 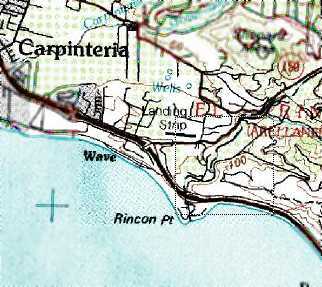 a bowl-shaped dirt racetrack located just south of Carpenteria up on a bluff north of the famed 'Rincon' surfing spot. The last aeronautical chart depiction which has been located of Parsons Airpark was on the 1964 Sectional Chart. It depicted Parsons as a public-use airport having a single paved east/west runway. A circa 1965 aerial view depicted closed-runway “X” symbols on either end of the Parsons runway. as it was no longer depicted on the February 1969 LA Sectional Chart (courtesy of Ron Plante). 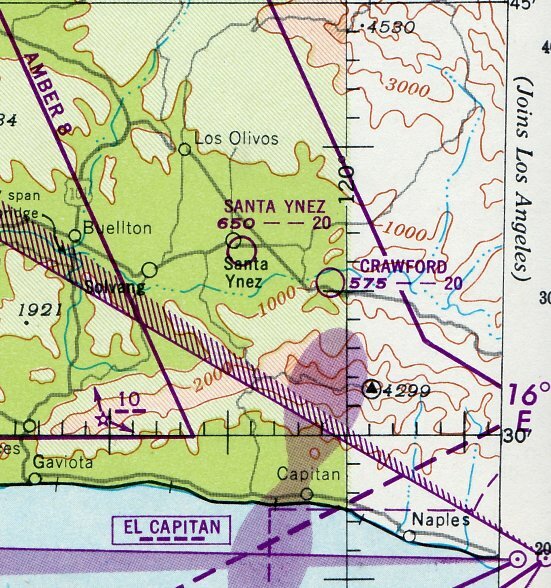 The 1978 USGS topo map depicted a single east/west runway, labeled simply as “Landing Strip”. 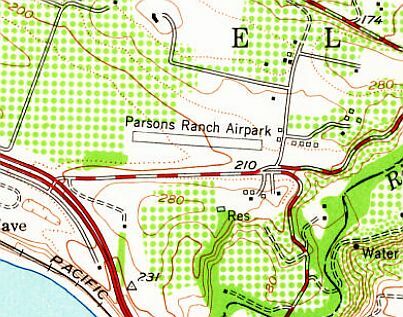 Parsons Airpark was no longer depicted at all on the 1988 USGS topo map. trees had sprouted up along the middle of the runway. with 4 former T-hangars on the east side of the ramp, and another hangar on the west side. but the hangars remained intact. A 2009 photo by Greg King looking west at the T-hangars which remain at the site of Parsons Airpark. 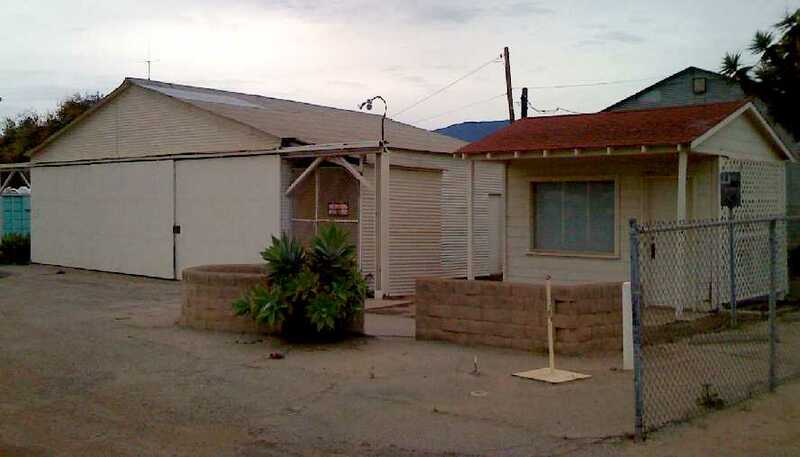 A 2009 photo by Greg King of the former main hangar & airport office of Parsons Airpark. Greg remarked, “The location is beautiful, I wish this airport was still in service. A 2009 photo by Greg King of the interior of a hangar at Parsons Airpark. A 3/30/15 photo by Peter Carlson of the former main hangar of Parsons Airpark. A 3/30/15 photo by Peter Carlson of the T-hangars which remain at the site of Parsons Airpark. The site of Parsons Airpark is located north of the intersection of Route 150 & Rincon Hill Road. Thanks to Greg King for pointing out this airfield. 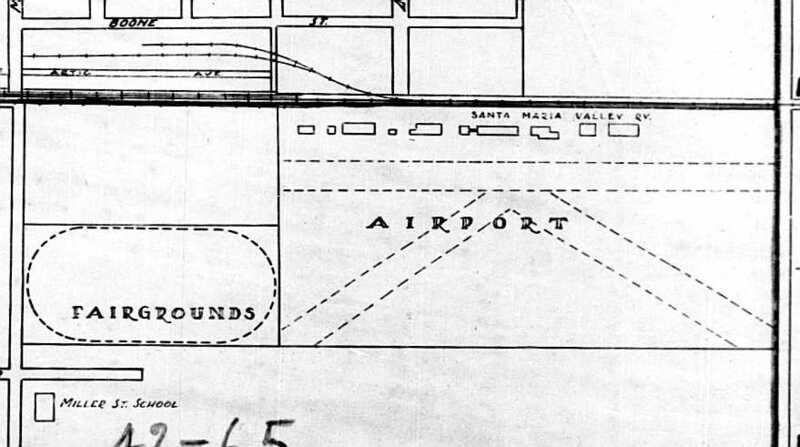 Crawford Airport, as depicted on the August 1948 San Francisco Sectional Chart. as it was not yet depicted on the 1943 USGS topo map (courtesy of Dallam Oliver-Lee). The earliest depiction which has been located of Crawford Airport was on the August 1948 San Francisco Sectional Chart. which depicted Crawford as having a 2,000' unpaved runway. The 1948 USGS topo map (courtesy of Dallam Oliver-Lee) depicted Crawford as a commercial/municipal airport. which may have been an error, as every subsequent depiction placed Crawford Airport on the north side of Route 150. Or it is possible the airport was first located for a short period of time on the opposite side of the road. The earliest photo which has been located of Crawford Airport was on a 6/28/53 aerial view (courtesy of Dallam Oliver-Lee). 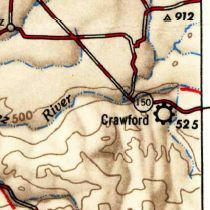 It depicted Crawford as a single unpaved northwest/southeast runway, on the north side of Route 150. One small building (possibly a hangar) was located to the northeast. as a single northwest/southeast 2,100' runway labeled simply as “Landing Strip”. 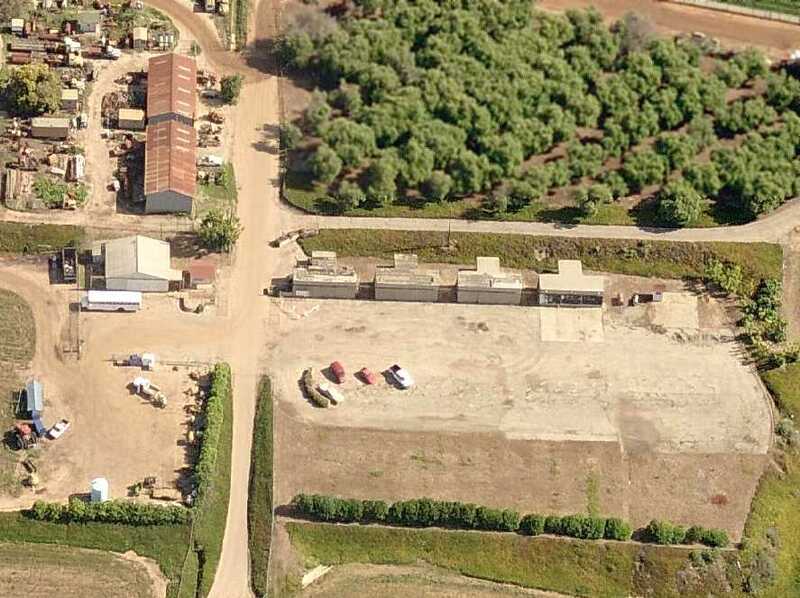 One small building (possibly a hangar) was located to the northeast of the hangar, and the San Luis Ranch was depicted a little father northeast. 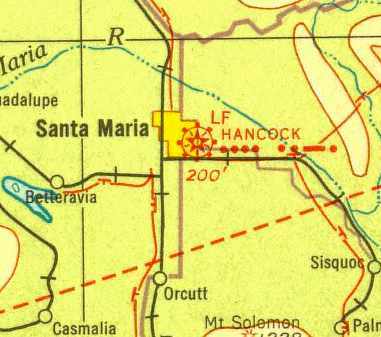 Crawford Airport was not depicted on the 1966 San Francisco Sectional Aeronautical Chart. had gained a paved runway & a 2nd small hangar at some point between 1959-94.
and a short northwest portion of the runway had been widened for the use of a radio-controlled model aircraft club. A 2013 aerial view looking northwest showed Crawford Airport & its 2 hangars to remain intact, though with closed-runway “X” symbols at either end of the runway. An 11/26/14 aerial view by John Wiley looking southeast at Crawford Airport & its 2 hangars. 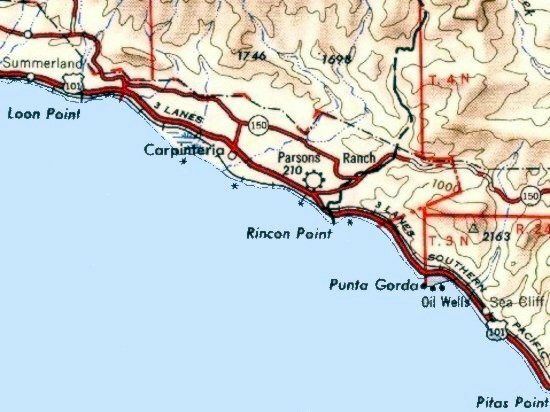 Crawford Airport is located northwest of the intersection of Route 154 & Cachuma Village Road. Thanks to Dallam Oliver-Lee for pointing out this airfield. at the Lompoc Airport on the occasion of the airport's dedication. The Tri-Motor was the largest aircraft to have landed at the airport at that time. 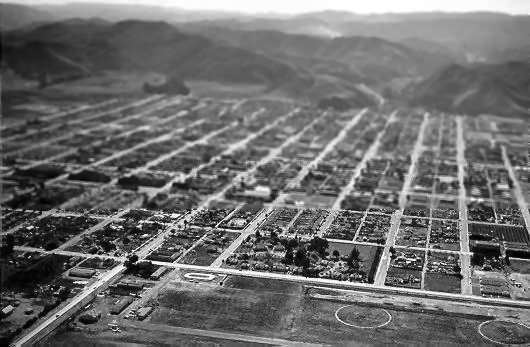 The development of a municipal airport was first considered by the town of Lompoc in 1920.
on land bordered by H Street & O Street, and College Avenue & Pine Avenue. It depicted Lompoc as a commercial or municipal airport. with a hangar on the southeast side of the field. 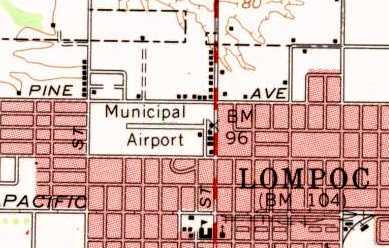 Lompoc Airport as depicted on a 1938 street map (courtesy of Kevin Walsh). A 1/21/38 aerial view (from the UCSB Library) depicted Lompoc Airport as having an unpaved east/west runway, with a hangar on the southeast side. 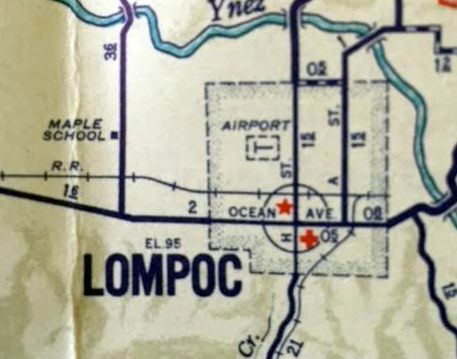 depicted Lompoc as a commercial or municipal airport. to support antisubmarine blimp operations from NAS Santa Ana. The Lompoc Airport site was chosen, and construction of expanded facilities began in 1942. The station was commissioned in 1943 as Lompoc Naval Auxiliary Airfield. and barracks for a total of 97 personnel. Five days after the commissioning of NAAF Lompoc, it suffered its only fatalities. came into proximity of a nearby high voltage power line. the 2 blimp mooring rings were quite prominent. A circa 1943-45 photo of a Navy blimp moored at Lompoc. 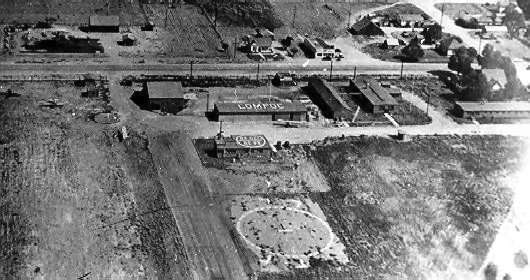 A circa 1943-45 aerial view of a blimp at Lompoc (courtesy of Harry Gordon). consisted of a one or two blimp detachment from Santa Ana's ZP-31. as having a 1,000' hard-surface runway, with a dirigible mooring mast. "Lompoc (Navy)", as depicted on the March 1945 San Francisco Sectional Chart (courtesy of Chris Kennedy). as a 65 acre irregularly-shaped property within which was a 1,000' square landing mat & a 2,400' east/west oiled shale runway. and the station was placed into caretaker status. 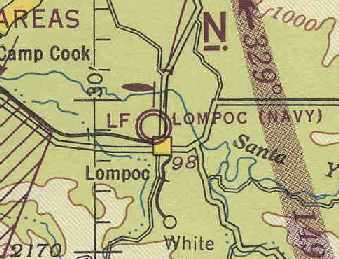 redesignated “Lompoc NAAF (LTA)” to “Lompoc Airport”, as of May 27, 1946. 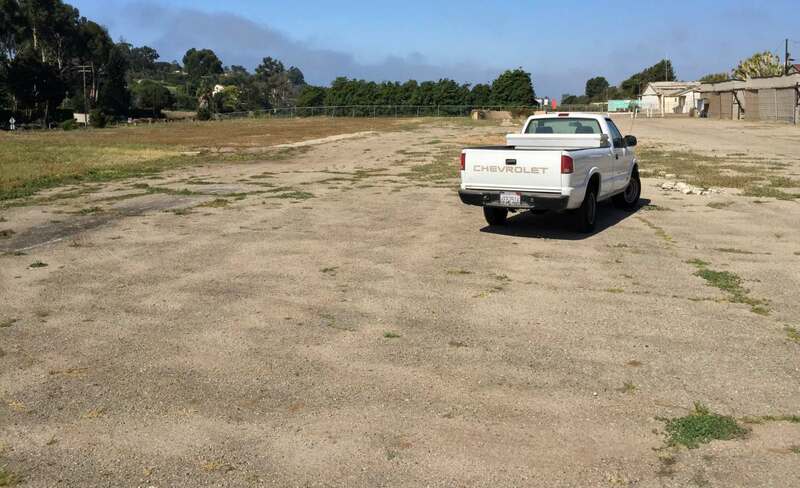 At this point the airfield once again became Lompoc's municipal airport. 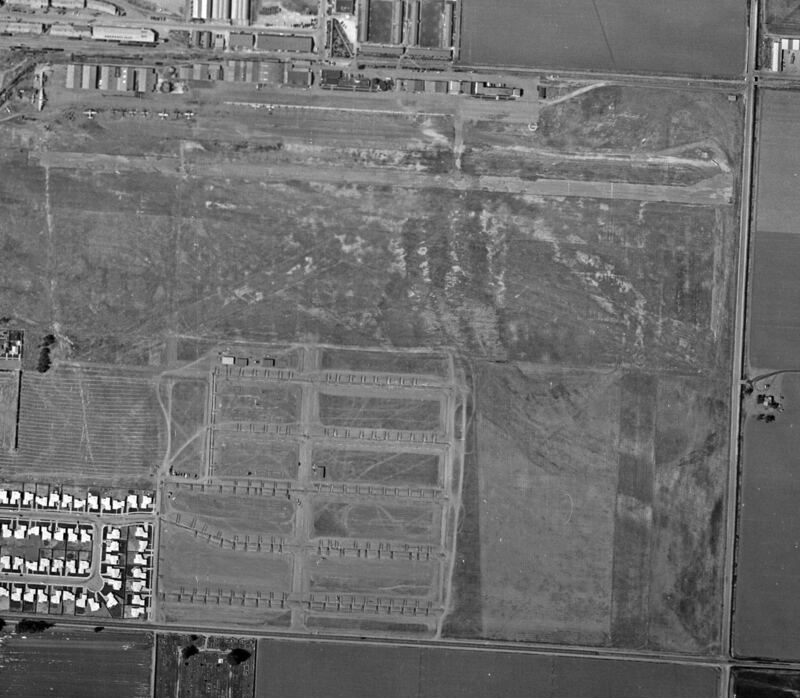 An undated aerial view looking east at the cluster of buildings on the east side of the original Lompoc Airport (courtesy of Harry Gordon). An undated aerial view looking south at the original Lompoc Airport, with 2 of the blimp mooring circles visible at bottom-right (courtesy of Harry Gordon). 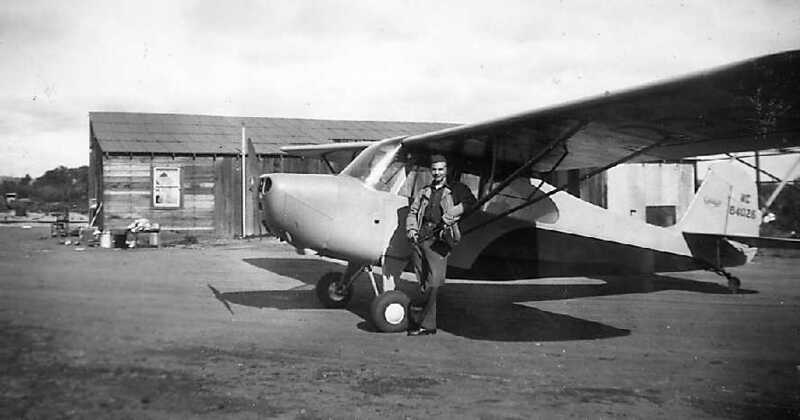 A December 29, 1946 photo by Harry Gordon of his good friend John Bennett in front of an Aeronca at the original Lompoc Airport. I rented an Aeronca Champion at Santa Barbara for a short cross-country to Lompoc Airport. Neither of us had flown in the area before, and we apparently landed at the wrong field. We found no facilities or airplanes and nobody there except a family living in a dilapidated building. I think we were told that commercial operations had been moved to another Lompoc Airport. A 12/29/46 photo by Harry Gordon of the runway of the original Lompoc Airport, with his Aeronca parked in front of the former airport operations building. What appears to be the framework of a former hangar (being dismantled?) was next to it. 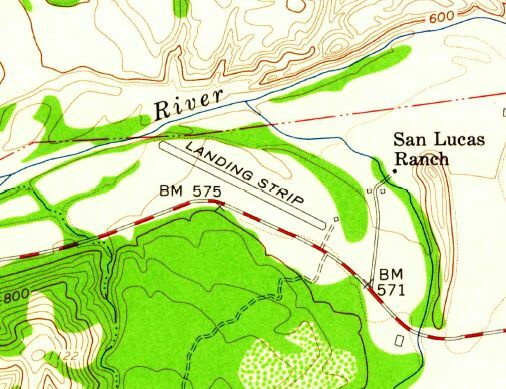 The 1947 USGS topo map depicted the original Lompoc Airport as an open area with several small buildings on the east side of the field. 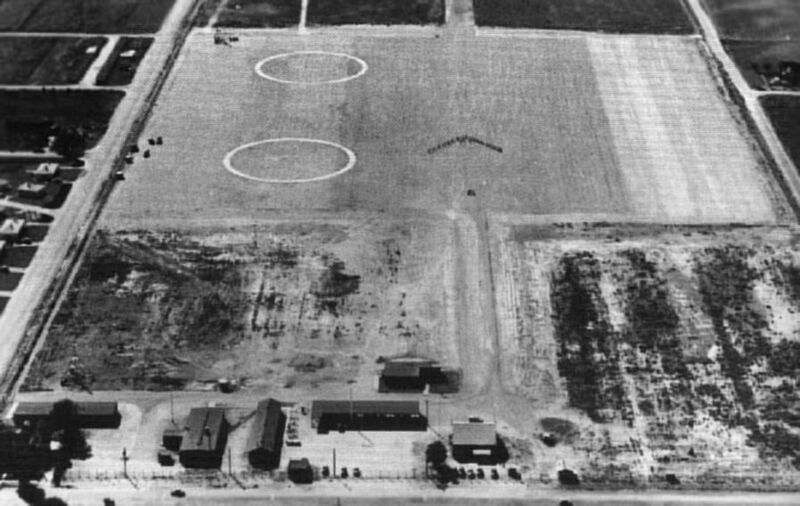 A 5/13/56 aerial view (from the UCSB Library) depicted Lompoc Airport as having an unpaved east/west runway, with the 2 former WW2 Navy blimp mooring circles still visible to the south. Two hangars (one with a checkerboard roof, another with “Lompoc” painted on the roof) were located on the southeast side, along with 2 light single-engine planes. with several small buildings on the east side of the field. which had a paved runway inset along the south side of the unpaved strip. A cluster of buildings was depicted along the southeast corner of the field. 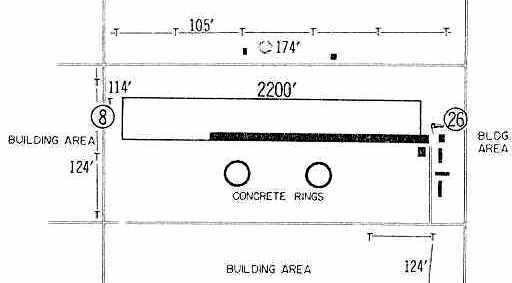 The 2 concrete rings originally used for blimp mooring were still depicted as well. 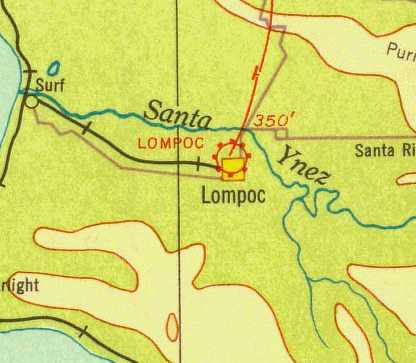 The original Lompoc Airport as depicted on a 1960 street map (courtesy of Kevin Walsh). 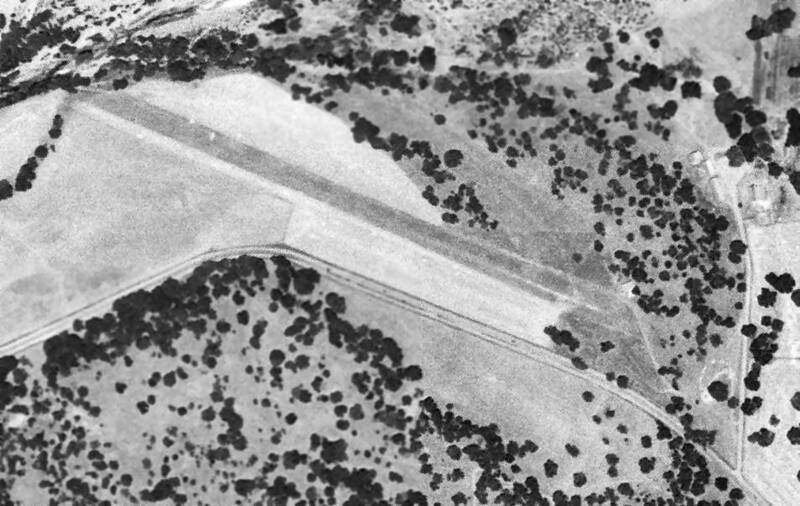 The last depiction which has been located of the original Lompoc Airport was a 4/1/60 USGS aerial view. The east/west runway was visible, as was the remains of the 2 concrete rings originally used for blimp mooring. 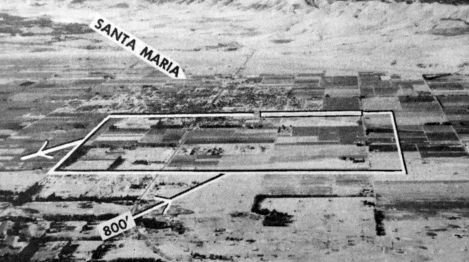 The airport property was eventually overtaken by the rapid growth of the town of Lompoc. and relocated the airport to that site in 1960. 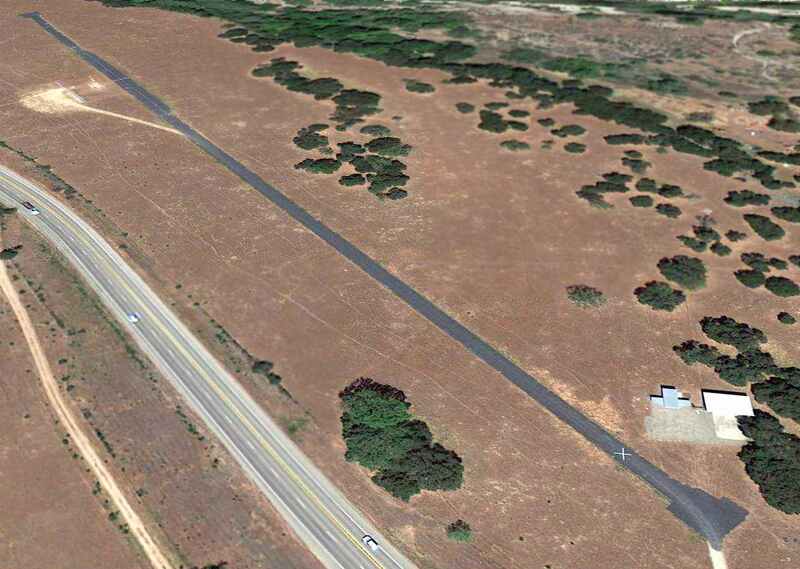 A 2003 photo by Tim Tyler of the site of the old Lompoc Airport. with school buildings & numerous individual athletic fields." Staples, and smaller enterprises all along the east end. one building remains from the Naval Auxiliary Air Field. After the war, possibly after Korea, this area was acquired by the Housing Authority of Santa Barbara County for use as low-income housing. with not a trace remaining of the former airport. 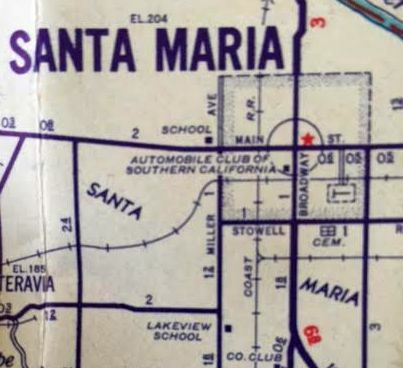 "Santa Maria" Airport, as depicted on the 1929 "Rand McNally Standard Map of CA With Air Trails" (courtesy of Chris Kennedy). Hancock Field was founded in 1927 by Captain Allan Hancock. It was dedicated as the community's airport the following year. 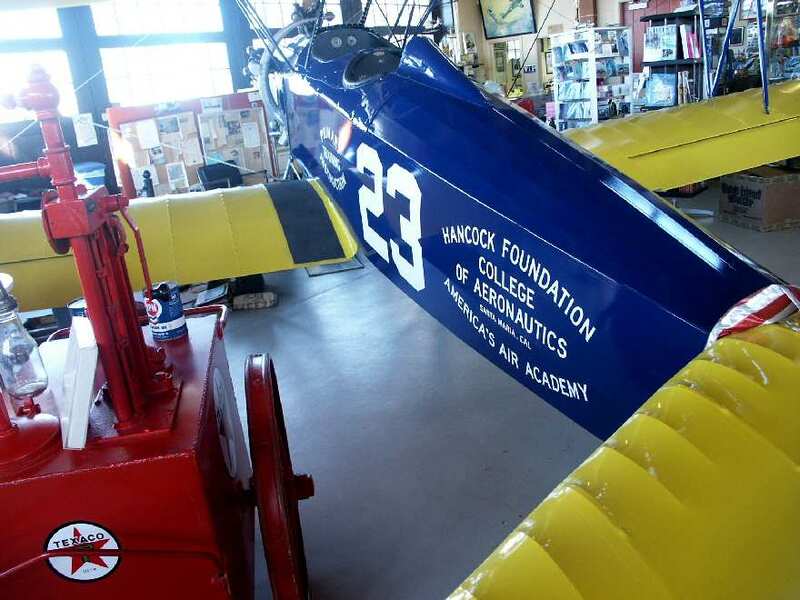 The Hancock Foundation College of Aeronautics was established in 1928.
with successful individuals becoming licensed pilots. Graduation of the first students occurred in 1929.
and that the field measured 2,680' x 500'. 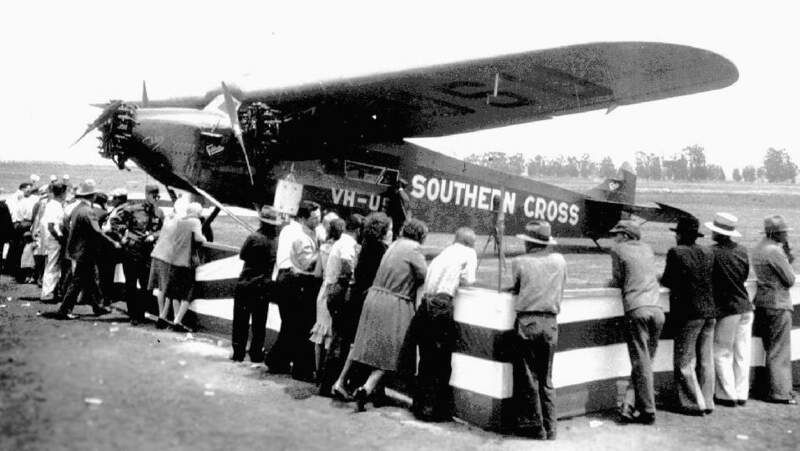 The "Southern Cross" Fokker Tri-motor, visiting Hancock Field in 1930. It had gained fame by accomplishing the first trans-Pacific flight by Charles Kingsford-Smith in 1928. It depicted Hancock as a commercial or municipal airport. described Hancock Field as consisting of a 2,600' x 2,600' oiled landing area. while "Hancock Field" was painted on the roof of the eastern hangar. Hancock Field, as depicted on a 1938 street map (courtesy of Kevin Walsh) – the sideways “T” symbol southeast of the center of the town. to provide primary training to military aviation cadets. This training began in 1939, just 40 days after Captain Hancock had met with General Arnold. 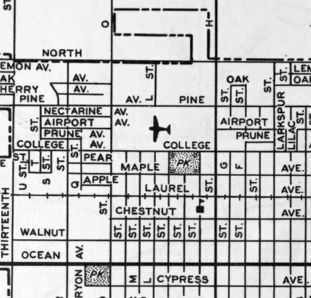 A 1940 street map (courtesy of Dallam Oliver-Lee) depicted Hancock Field as having 3 unpaved runways, with a row of buildings along the north side. A 1940 aerial view (from the UCSB Library) depicted Hancock Field as having an asphalt east/west runway, with a larger grass airfield to the south. A ramp along the north side had a large quantity of biplane trainers & a row of hangars. An undated view of Stearman trainers on the flightline at Hancock Field. depicted Hancock as a commercial or municipal airport. An aerial view of a large number of biplanes lined up on the Hancock Field flightline (courtesy of Tim Tyler). According to Bill McKee, this photo is pre-1942. 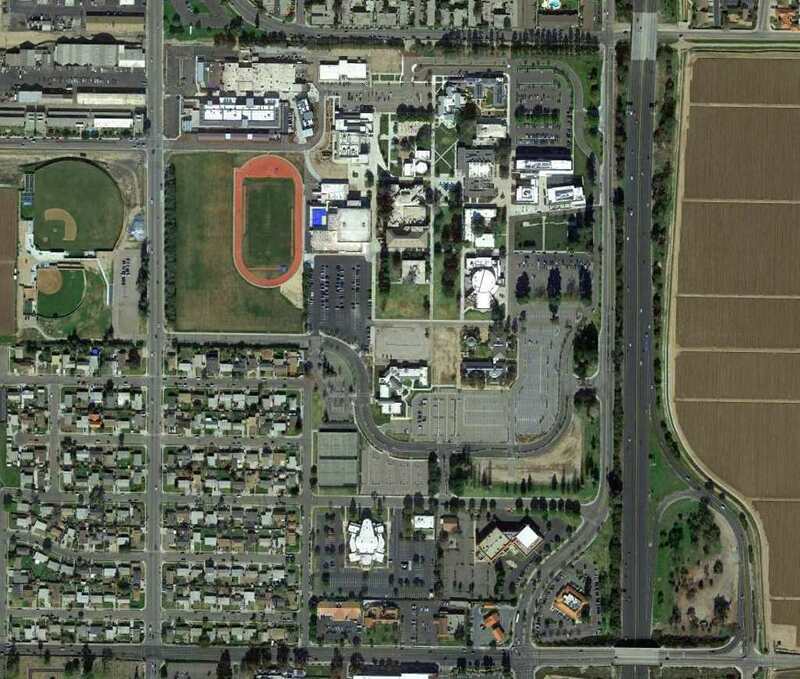 "The fairgrounds in the lower right of the photo were removed that year to allow for expansion of the field. The buildings look pre-war from other photos I have. Student barracks were added in 1940 & these are not on this photo, for instance." 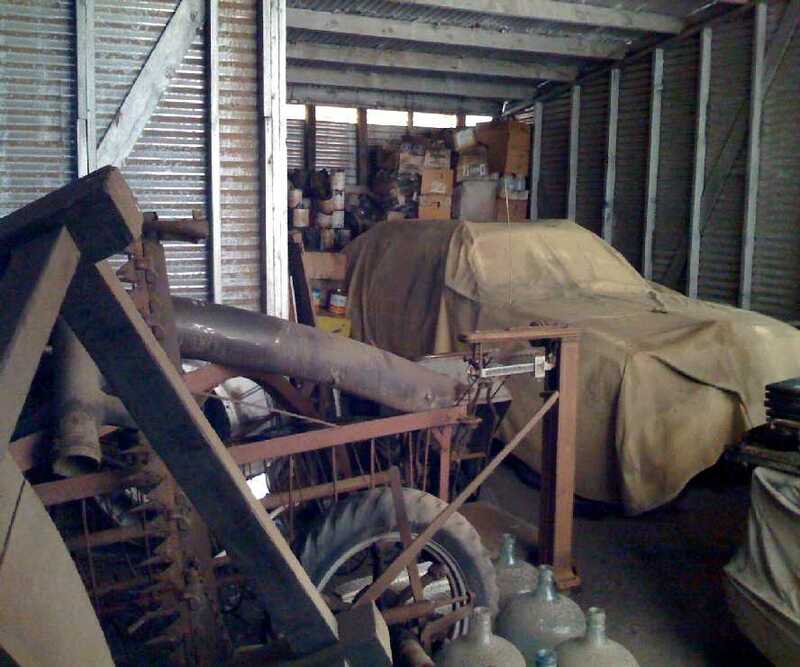 (courtesy of Dee Dee Benford, Santa Maria Historical Museum). before a larger influx of these really made for a large sized contingent on the ramp." 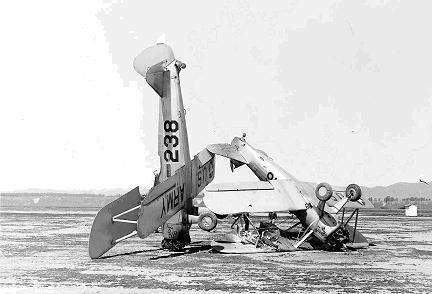 A 1942 photo of two Stearman trainers from Hancock Field which had collided (courtesy of Bill McKee). 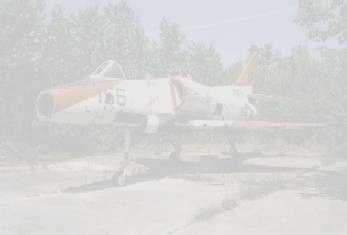 which was usually the case of these aircraft provided by the Army & maintained by the contractor." 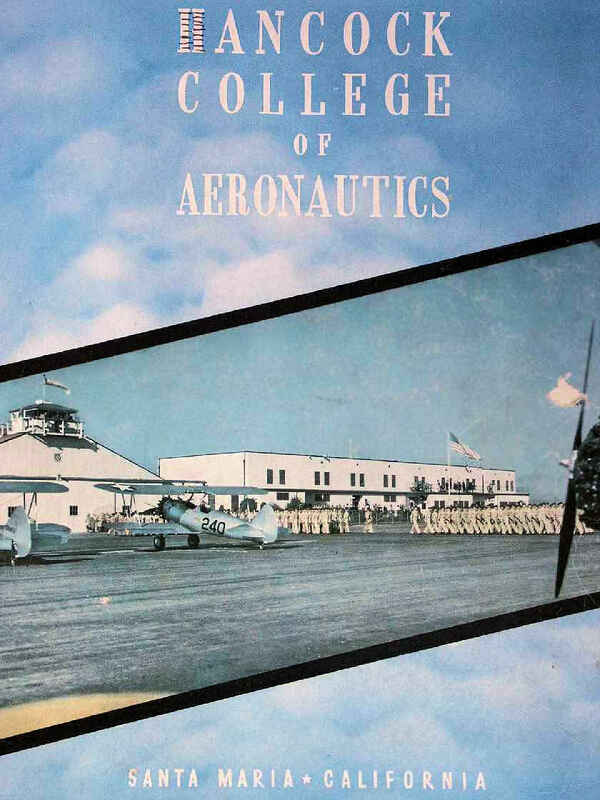 An undated Hancock Yearbook, a publication of the Hancock School of Aeronautics (courtesy of Tim Tyler). the predominant trainer aircraft used at Hancock Field was the Stearman PT-13 biplane. Rarely a week would pass without a crash. with pilots often needing to make emergency landings in the dry Santa Maria riverbed. depicted Hancock Field as having a rectangular landing area with a ramp & buildings along the north side. Ken Barber recalled that Hancock Field was “my primary flight school where I first soloed the PT-13 Stearman. where after a strenuous evaluation was selected for pilot training & sent off to Santa Maria in September 1943. I actually soloed at an auxiliary field at Guadalupe which was over toward the coast. We also used other auxiliary fields for other purposes. and have a special graduation certificate showing that I indeed graduated from that specific school. although the remarks included, "3,900' turfed landing area available." 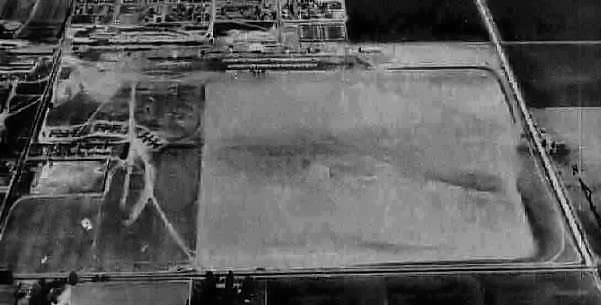 A 10/23/44 aerial photo (courtesy of Dallam Oliver-Lee) depicted Hancock Field as having an unpaved airfield with a row of buildings along the north side. Military flight training at Hancock Field continued until 1944.
on the March 1945 San Francisco Sectional Chart (courtesy of Chris Kennedy). 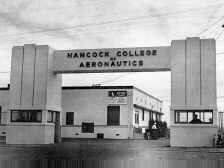 An undated photo of the gate of the Hancock College of Aeronautics. and a 3,900' x 2,600' all-way sod landing area. After the war Hancock Flight School was leased to USC for use as a 4-year Aeronautics Degree program. 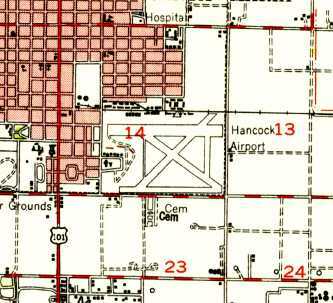 The 1947 USGS topo map depicted Hancock Airport as having 3 paved runways & taxiways, with buildings along the north side. depicted Hancock as having a 3,400' hard-surface runway. An August 1949 photo by Bill Larkins of a historic Bell P-59A (44-22614) which was languishing at the Hancock College of Aeronautics. 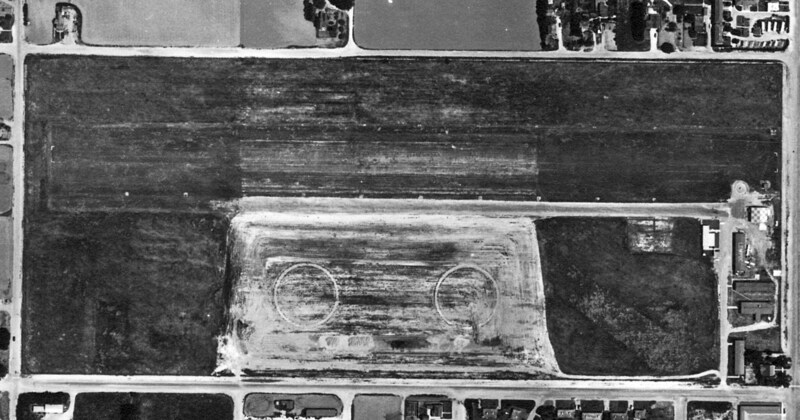 An undated aerial view looking north at Hancock Field from the 1950 Air Photo Guide (courtesy of Kevin Walsh). The guide described Hancock Field as having 3 runways, with the longest being the 3,800' graded Runway 10/28. It listed the manager as James Stone. During the Korean War the Hancock school was used to train aviation mechanics. 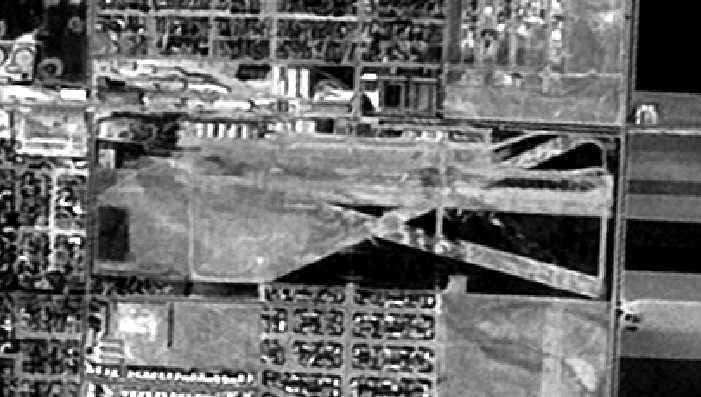 The last photo which has been located showing aircraft at Hancock Field was a 5/26/52 aerial view (from the UCSB Library). The runway pavement was considerably deteriorated, but there were a dozen aircraft visible on the ramp, including one large 4-engine transport or bomber (model unidentified). and began construction of what is still operated today as the Allan Hancock Community College. 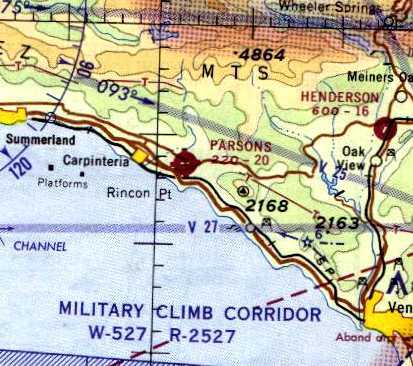 as it was still depicted as an active airfield on the 1955 & 1956 San Francisco Sectional Charts (according to Chris Kennedy). The Aerodromes table listed the airfield as having 3 runways, with the longest being a 3,300' "road mix" strip. 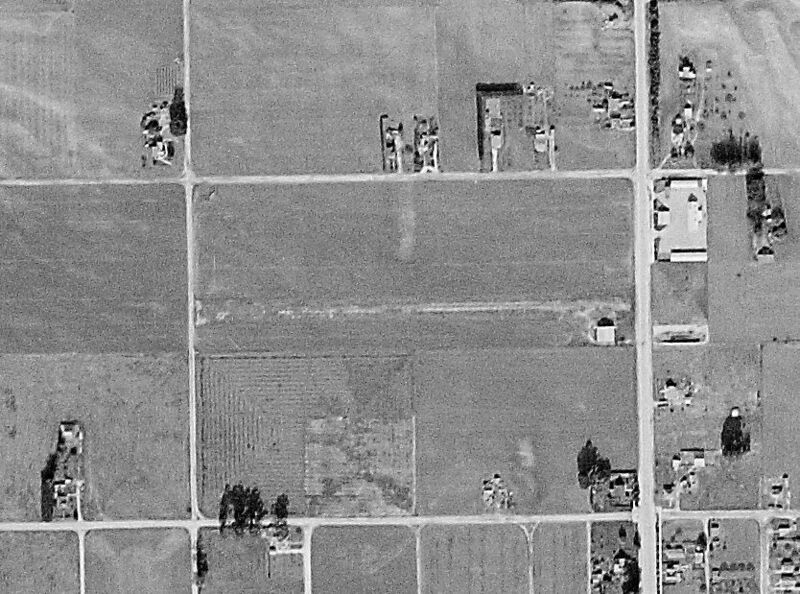 was on a 6/27/56 USGS aerial view (courtesy of Dallam Oliver-Lee). It depicted Hancock Field as having 3 runways. was on the September 1957 San Francisco Sectional Charts (courtesy of Dale Knutsen). It depicted Hancock Field as having a 3,300' paved runway. 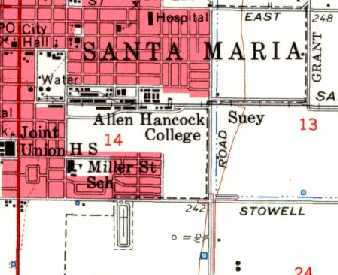 as the 1959 USGS topo map depicted the buildings of Allen Hancock College, but the airfield itself was no longer depicted at all. appeared to show Hancock Field remaining largely still intact. showed buildings starting to cover the airfield area of Hancock Field. Hancock Field was no longer depicted at all on the 1966 San Francisco Sectional Chart. 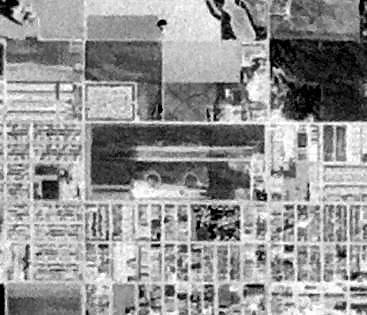 showed that buildings had covered the site of Hancock Field's runways at some point between 1960-78. A 2003 photo by Tim Tyler of "Building Y", which appears to date from the Hancock Field days. Tim Tyler visited the site of the former Hancock Field in 2003.
that has a signature of perhaps dating back from the airfield days (warehouse, barracks, etc.). The windows are now boarded up, and it looks like it most recently housed the college’s Academic Affairs offices. Another college building that looks to be from the Hancock Field days is known as Building Y. 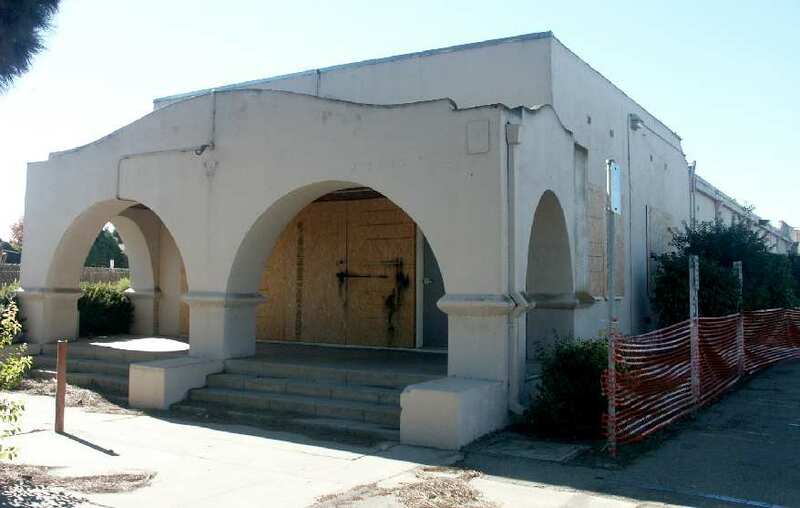 It is a concrete building with minor mission-style architecture, all boarded up now. and is located along College in between Oak & Park Avenues. It looks to be of similar age & design to Building Y. Sadly, Allan Hancock College doesn’t seem to offer any aviation related classes these days." A 2003 photo by Tim Tyler of former hangars which remain at the site of Hancock Field. German Joe’s Mobile Repair & Custom BBQs. but they do look to be from the right era." 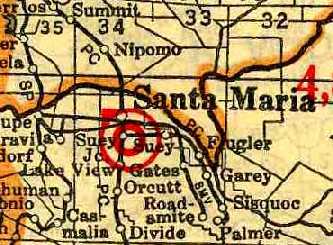 Ross Mayfield reported in 2004, "I live near & work in Santa Maria. 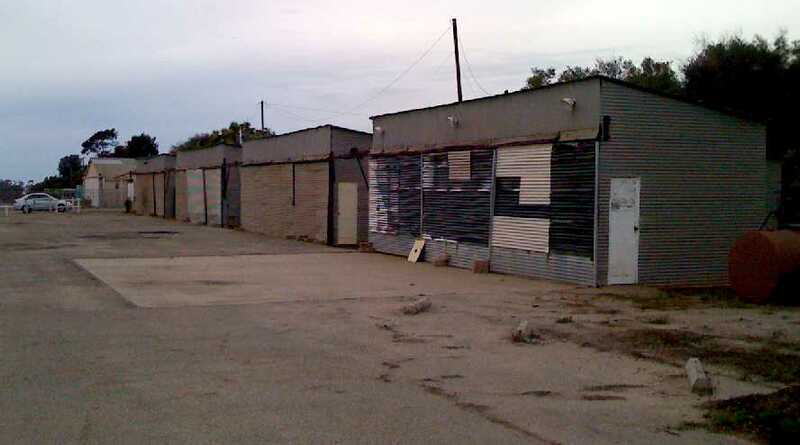 We used to have a business located in one the hangars west of the college. are all former Hancock Field Hangars. 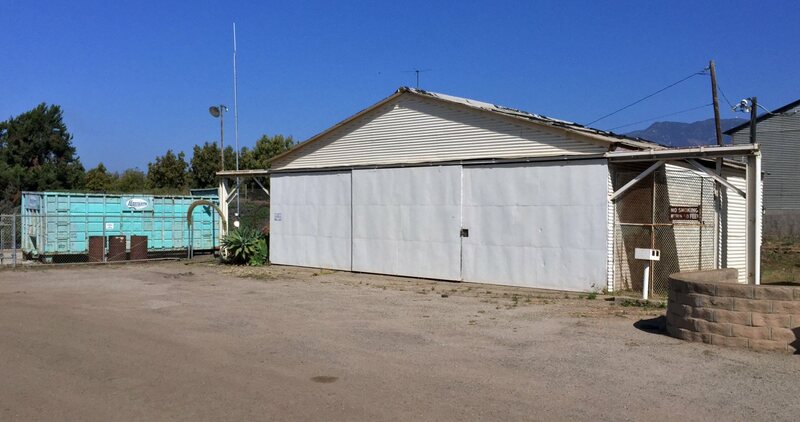 There are also 4 hangar buildings from the original Hancock field that were relocated to Santa Maria Airport. was a sign stating that no responsibility was claimed for items left inside of aircraft parked there. were featured in the film "Spirit Of St. Louis" starring Jimmy Stewart [released in 1957]. Many of the aviation scenes in the film that take place prior to the flight to Paris were filmed at Hancock Field." A 2003 photo by Tim Tyler. accurate to aircraft flown by the Hancock Foundation College of Aeronautics in the early 1930s. 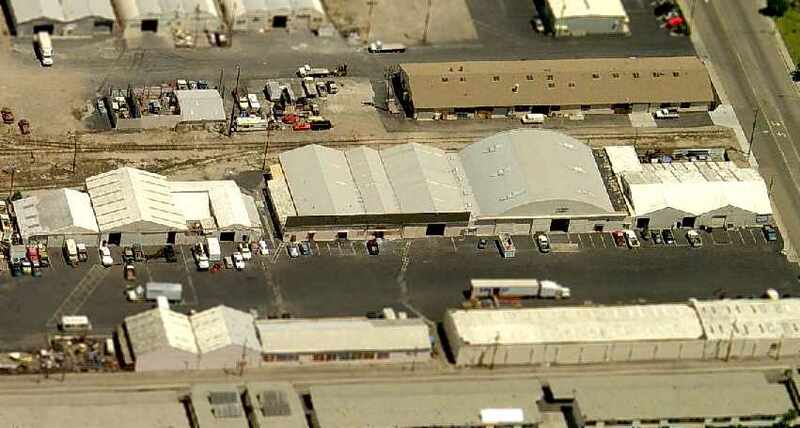 A 2006 aerial view looking north at the row of 60-year-old hangars which remain at the site of the original Hancock Field. 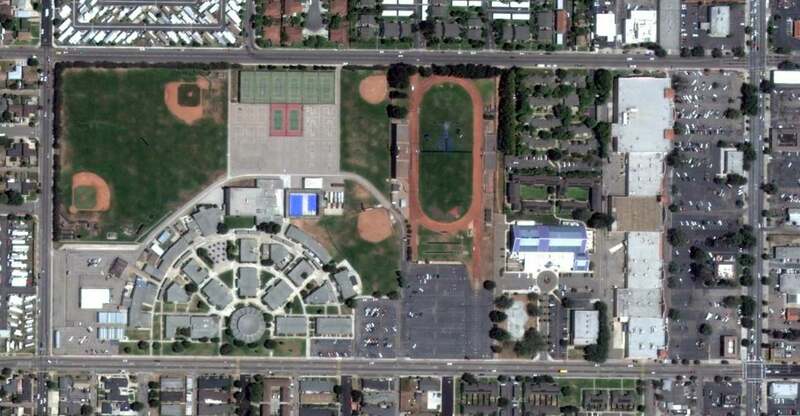 A 2015 aerial view of the site of Hancock Field, since reused as the site of the Allan Hancock Community College. (several miles southwest of the original Hancock Field) has adopted the name Hancock Field. 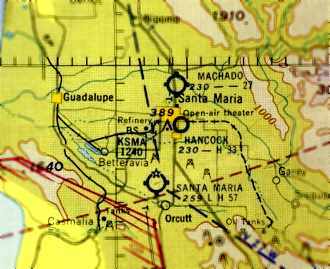 The Santa Maria Museum of Flight is located at the Santa Maria Airport.